A Midwesterner escaping a frigid winter couldn’t have asked for a better day for a test sail and it wasn’t long before we shut off the engine and settled into port tack, having easily rolled out the furling main and 105% genoa. What struck me most was how well balanced the 38 was. It heeled just enough to nestle into the chine, where it happily stuck with nothing more than the occasional fingertip on the helm. Canfield said the boat heels about 5 degrees less than a traditional round-hulled boat. Sailing on a fat beat, the boat chugged along at an impressive 7 knots in about 9½ knots of wind and, with the main tending itself, tacking was a singlehanded operation easily accomplished by the helmsperson. Again the boat seemed to find its comfort zone easily. With the borrowed gennaker aboard, we were anxious to head downwind to try it out. Tacked to the stem fitting and outfitted with a gennaker sock, setting the chute was a relatively simple affair that Harring managed in a matter of minutes. With the sock raised and the gennaker flying, the 38 immediately responded to the extra horsepower, clearly enjoying having the reins loosened a bit. Jibing, of course, took a bit more work than tacking, with Harring helping the gennaker around and another person managing the sheets, but had we opted to drop the sock to jibe, that too could have been a singlehanded operation. As we enjoyed our spin around the bay, the wind freshened to more than 13 knots and we couldn’t help but aim for speed on a reach. We were rewarded with a glimpse of 9.2 knots on the speedo before easing out and turning down as some of the rest of the South Coast Yachts team gathered on shore to catch a glimpse of the 38 zooming along with the gennaker up. Having run out of excuses to stay on the water any longer, we furled the sails and powered in, giving the engine a bit of a test along the way. The 30-horsepower saildrive delivered 8.3 knots at max rpm and 7.4 knots at 3,000 rpm without any uncomfortable vibrations and we never had to raise our voices, which were still busy talking about our exhilarating sail. The Oceanis 38 was instantly popular with buyers and with the variety of options available and the excellent performance, it’s no surprise that it has already spurred a little sister. 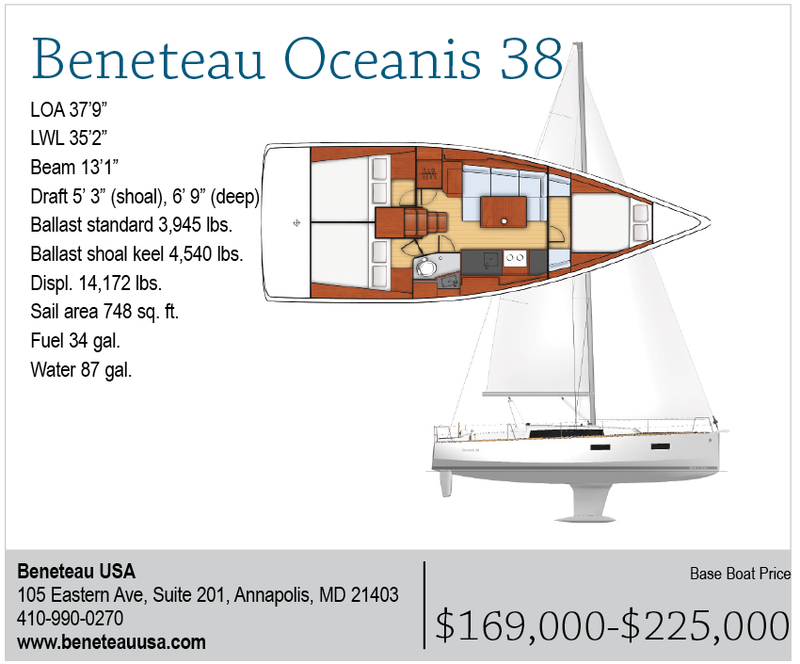 The Oceanis 35 will make its debut at the U.S. Sailboat Show in Annapolis. 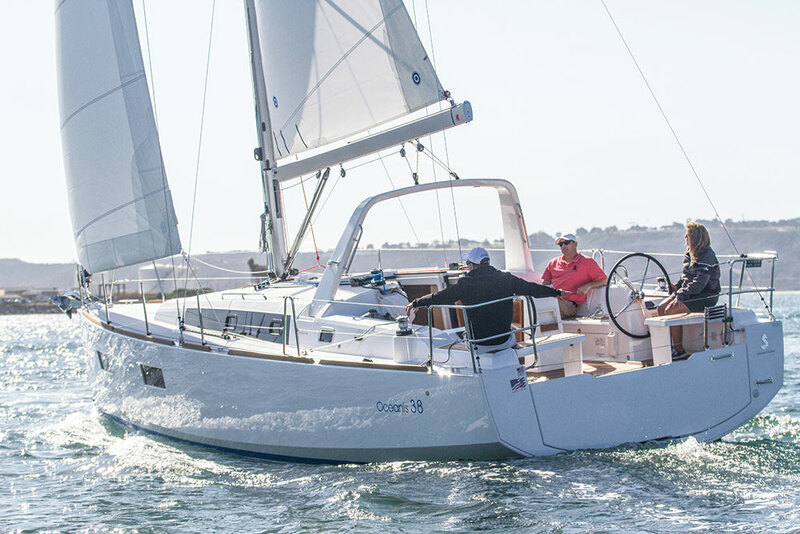 But for the large group of sailors looking for a boat in the 40-foot range, it would be hard to argue that the Oceanis 38, which looks, feels and sails like a much larger boat, could be more spot on.